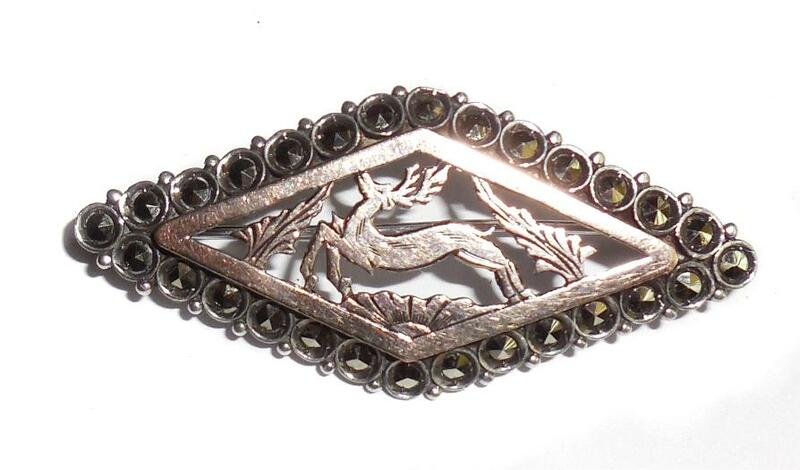 This is a vintage Art Deco hand cut sterling silver running deer pin with a border or large marcasites and a 1930s yellow gold wash on the center scene. It is not marked but has been thoroughly tested and is guaranteed to be solid sterling silver. Not plated. The back has its original antique vintage C clasp which was restored many, many years ago. It is strong and secure. Size is 2" long East to West by 15/16" wide across North to South. It is from an estate and was very well cared for over the years. Other than some very faint surface scratches that are not eye obvious when worn is it in excellent condition. Gently used. No dents or dings. No missing stones. No wear to the 1930s gold wash. It has not been touched or polished. This is a lovely detailed pin for your vintage and antique jewelry collection.. This is a lovely, 1930s vintage Art Deco Portuguese sterling silver filigree flower pin Large size. All handmade the old way in separately hand applied pieces by a quality silversmith. See photos of back. The front has a beautiful long stemmed rose flower pin with a light gold wash. It has Portuguese silver hallmarks dating from 1930 or earlier on the back. Additionally, it is jeweler tested and Guaranteed to be solid sterling silver. Much of the gold wash has worn with age. Other than this it is in excellent overall condition. From an estate. Completely original. No alteration or repair of any kind. All of the original filigree is complete and intact. No dents or dings or damage or repair. Many of these intricate, fragile pins did not survive over the years so it is nice to find a big one. It is very detailed, well-made and finely hand crafted. Size is 3 5/16" tall North to South by 1 3/8" wide East to West across the center. This is a beautiful showy statement pin for your antique and vintage jewelry collection. 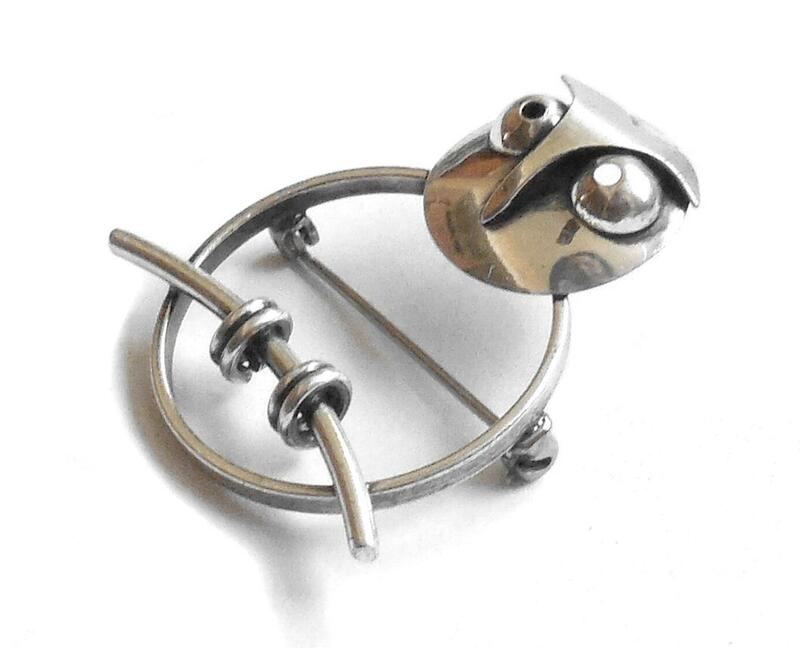 This is a signed BEAU Sterling Silver 1960s mid century modernist owl pin in gently used condition. Sorry for any photo glare. The area directly around the beak, eyes and back of head have an oxidized finish. The rest of the face is plain sterling silver, not oxidized. Size is 1 5/8" tall North to South by 1 3/8" wide East to West across the branch. A lovely signed pin for your vintage mid century modernism jewelry collection. Condition Details: Excellent, gently used. No dents or dings. No tears or repair. Good strong locking clasp. No repair or alteration. 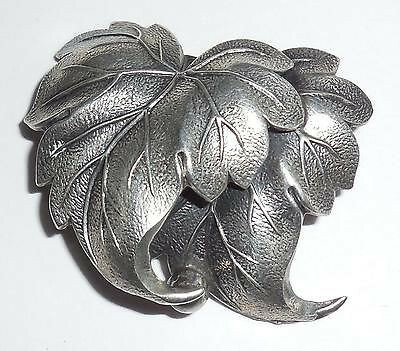 This is a vintage Beau sterling silver pin of twin wind blown maple leaves. Marked Beau Sterling. Very detailed. The sterling silver is textured and the leaves are completely blown out design. Size is over 1 1/4" wide across the center by 1 1/8" tall.Excellent no damage condition. A lovely vintage statement pin for your collection. This is a gorgeous heavy sterling silver enameled daisy pin with cut steel marcasites in great condition. Marked 925, tested and guaranteed to be solid sterling silver. It has very fine quality workmanship with very thick, strong, solid 925 sterling silver....very weighty at 30.2 grams. You can see the quality and feel the weight in your hand. The locking clasp works well and is secure. 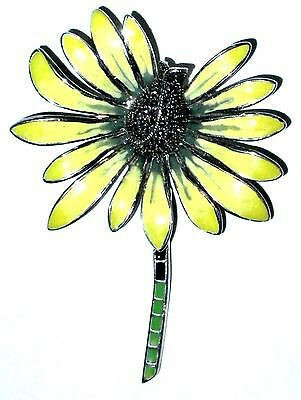 This is a stunning daisy pin for your collection. This is a vintage 2 & 3/4" long green chrysoprase chalcedony sterling silver pin with cut faceted marcasites. Excellent condition. No damage or repair. It is marked 925 with a hallmark of a bird in a long shield. The 925 may have been added by a jeweler later. The stones are nicely cut and semi translucent with a deep green color. The cut steel marcasites are sparkly and bezel set. Size is 2 3/4" by 1/4" wide. It is well made with a strong locking clasp. 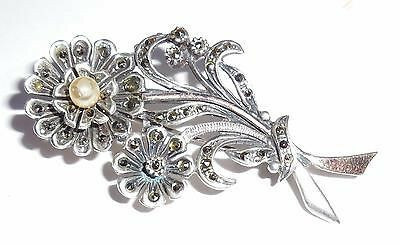 This is a very pretty vintage statement pin for your collection. 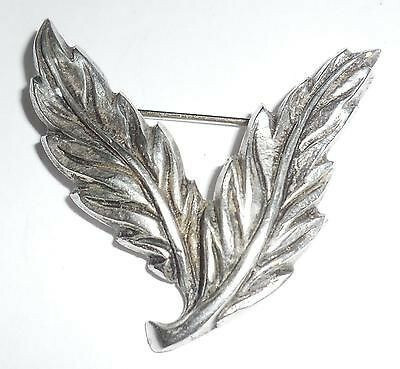 This is a very thick Charles H Layng hand made sterling silver twin leaves pin Charles H Layng. Marked Sterling, Chas. H. Layng and well made of heavy gauge substantial sterling silver. Weight is 11 grams. Size is 1 5/8" tall on the diagonal by 1 1/2" wide across the top. 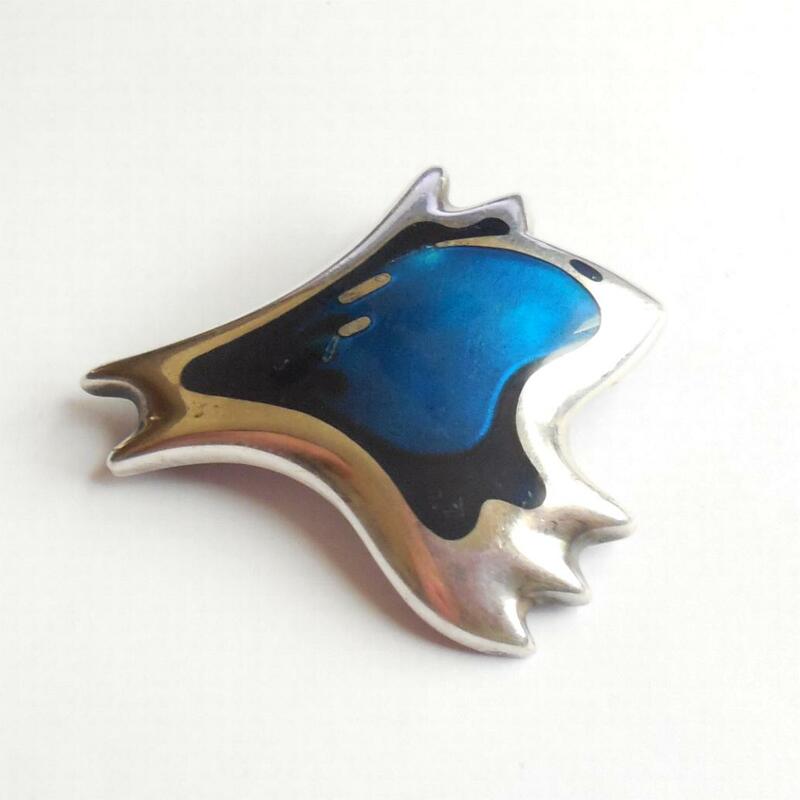 In excellent condition this is a lovely vintage statement pin for your collection. 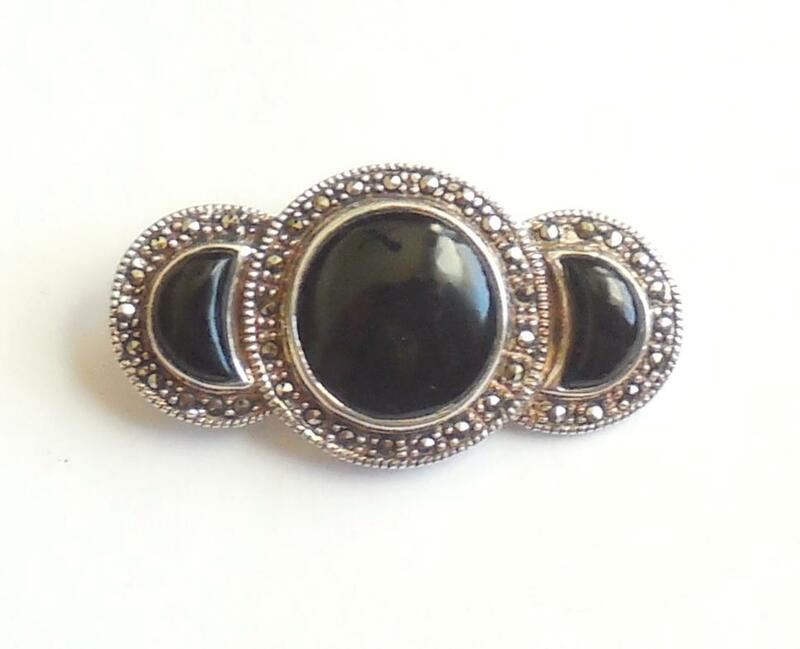 This is a thick, very well made, vintage 1980s vintage BOMA 925 sterling silver and faceted marcasites pin with lovely inspired Art Deco design and black onyx cabochon stones. In excellent, ready to wear condition with beautiful cut cabs that still have their original shiny polished finish. Not worn down. All of the sterling silver is also excellent. No dents, dings, damage or repair. The sterling silver hand crafted, very thick and strong. Nice quality workmanship. Size is 1 1/2" long by 13/16" wide across the center. It also has a wide Double thick locking mechanism that is strong and secure. 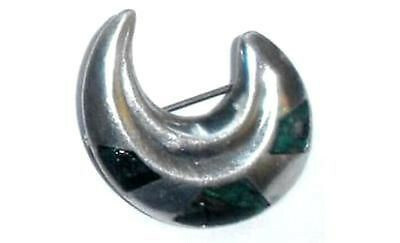 This is a beautiful pin for your collection; it has very unusual cut cabochons and a good, chunky sterling setting. Weight is 8 grams. 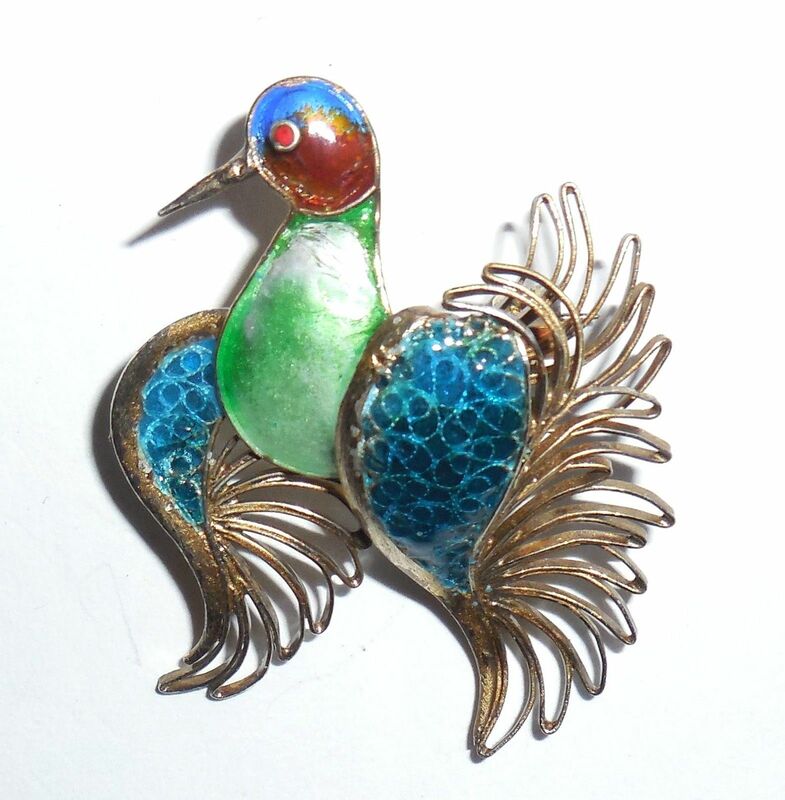 This is a very fancy Art Deco era hand crafted filigree Conditnental Portuguese 800 Silver and enamel exotic bird pin. Marked 800 and has a 1930s gold wash on the back. It is large, ornate, bright and colorful. Size is 1 5/8" tall North to South by 1 3/8" East to West wide across the wings. From an estate and in original condition. Well preserved. Not polished. Some age craze and age wear to the neck enamel. Other than this it is excellent. No damage or repair to the 800 silver. All filigree intact. This is a lovely fanciful hard to find large exotic bird continental silver pin for your vintage jewelry collection. All hand made. 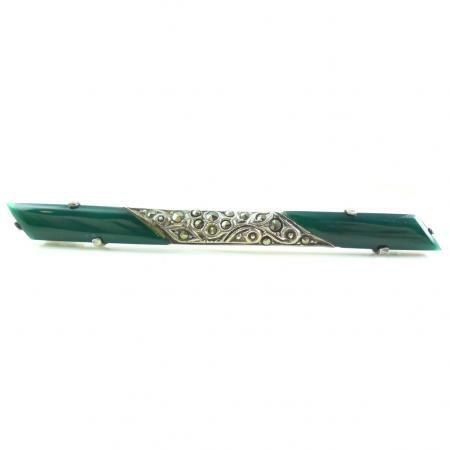 This is a vintage signed Cortes Mexican Sterling Silver crescent pin with turquoise and malachite mosaic inlay. It has a #3 eagle marking and is also marked plateria Cortes, 925 for sterling quality, and #282. It is all Hand Made and in excellent condition. Size is 1 3/16" by 1/2" wide. The artistry and hand crafting are excellent. A lovely signed vintage statement pin for your hand made Mexican silver jewelry collection. 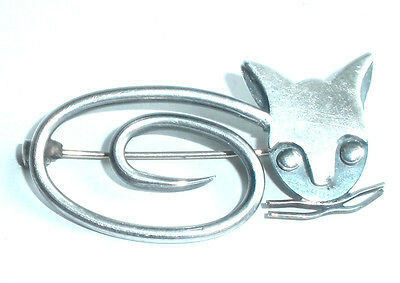 This is a vintage hand made Mexican sterling silver mid century modernist Delfino cat pin with nice old hallmarks. It has an unusual mask face with the lower part of the face having an oxidized finish while the other half of the face is raised with ball eyes. Size is 1 3/4" long by 3/4" wide on the body. It has fine quality hand crafting....good old workmanship and the sterling silver is very thick, solid, can't bend it. Condition is excellent. Lovely old pin for your vintage Mexican sterling silver or cat collection! 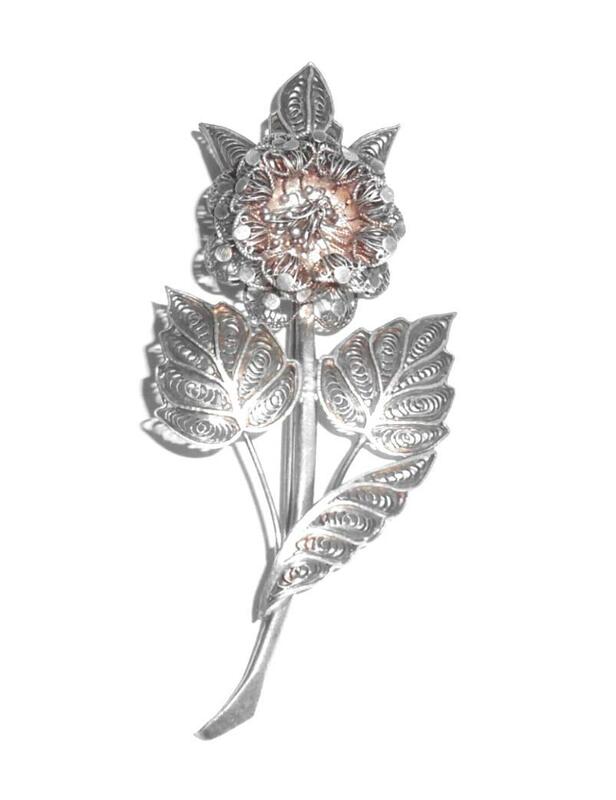 This is an antique Art Deco European, Danish 835 silver marcasite flower pin with a rose gold wash on the stem and a faux pearl. It has 2 old Danish 2 hallmarks on the back. Letter A over a bird head with 835 for a Danish European silver standard. Size is 2 1/4" long by 1 1/8" wide across the body. This is a beautifully made vintage European marcasite statement pin for your jewelry collection. This is a lovely vintage 1950s late Art Deco long fancy 800 European Silver pin with a 6mm deep red bezel set stone. Marked HS800. Original, excellent condition. No dents, dings, deep scratches, or repair. It is well made with a fancy engraved antique scroll design enhancing the red stone center, likely a synthetic ruby or garnet. Size measures 2" long East to West by 11/16" tall North to South at the wider points. This is a beautiful vintage statement pin for your collection. This is a vintage late Art Deco to mid century sterling silver and gold filled military navy estate pin. 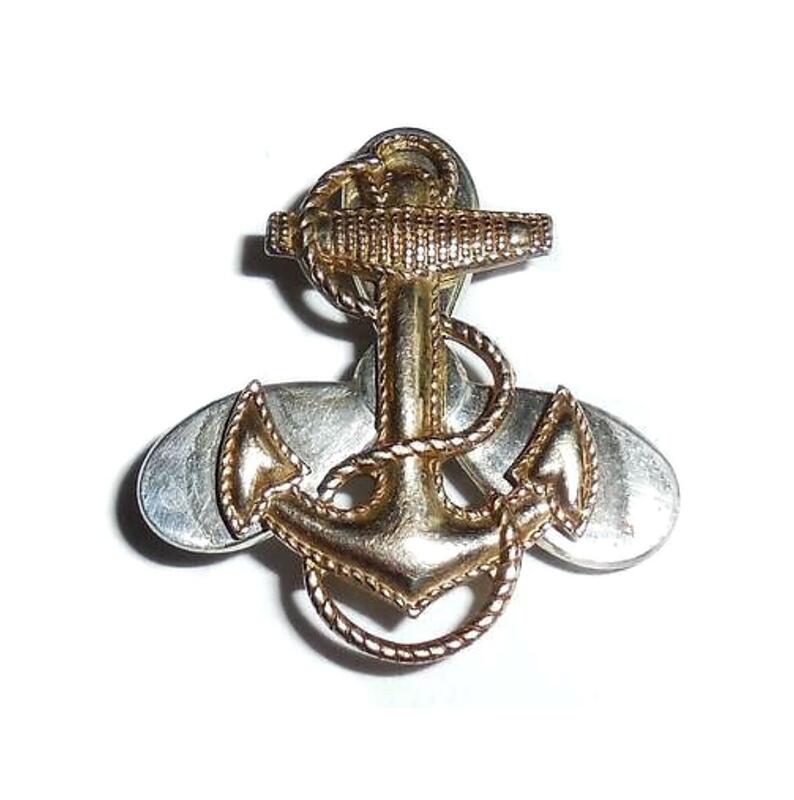 The anchor is gold filled and the rest of the pin is sterling silver. Size is almost 1 3/16" tall North to South by 1 1/8" wide across the propellers at the bottom. The gold filled propeller is hand applied and hand riveted in the back, the old way, true 1930s Art Deco to mid century crafting. It also has an early top lock where the pin rod goes straight down into the locking clasp. All original and excellent condition this is a lovely estate oldie for your collection. 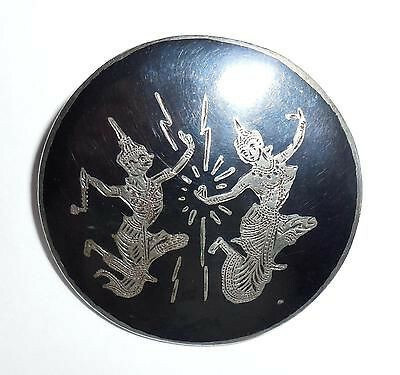 This is a vintage Siam sterling silver pin of fancy Asian Thai dancers with a dark niello finish. Marked Siam, Sterling. Also tested and guaranteed to be solid sterling silver. Size is 1 1/2" across. The hand crafting on the dancers is very delicate and intricate. A lovely old vintage pin for your collection. This is an older vintage late Art Deco to early Mid Century 1940s-1950s Handmade Native American Sterling Silver Pin with a large 14mm natural mined chalcedony or jade gemstone. It is from an Art Deco estate, has a worn maker mark under the pinback, and is all hand tooled. As can be seen on the photo of the back there are jeweler testing scratches and it is Guaranteed to be solid sterling silver. The 14mm large cab stone is pale yellow mustard to beige to green colors. Indicative of chalcedony or American jade. Size is 1 5/16″ wide East to West by 5/8″ tall North to South. Small medium yet quite thick, chunky and well made. Other than some average age wear that is not eye catching when used it is in excellent overall condition. No tears or deep gauges. Tooling is still very deep and crisp, noticeable. No cracks or chips to the large gemstone. 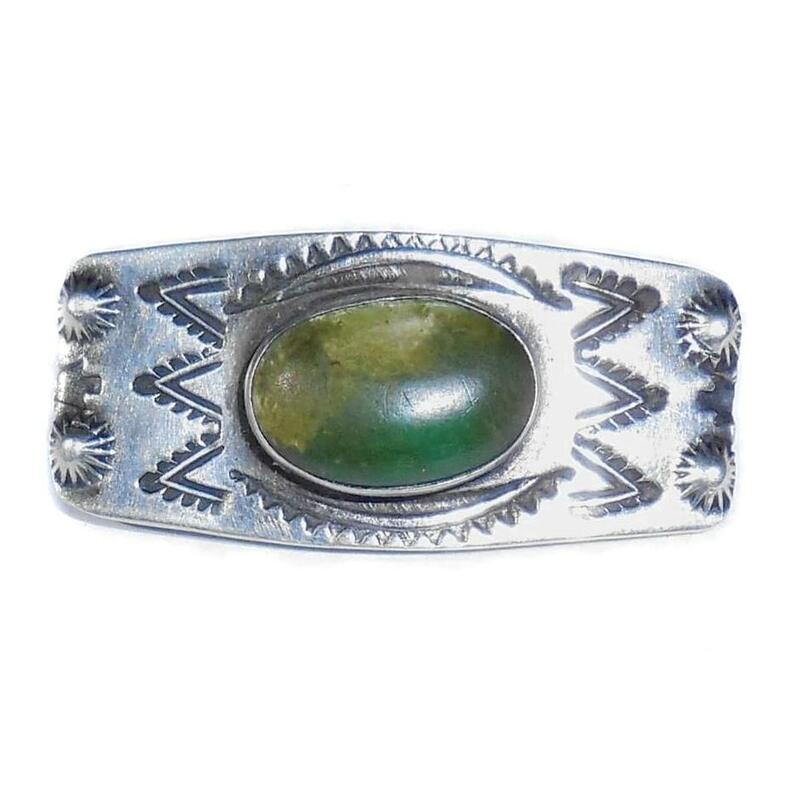 This is a lovely old estate find for your vintage Native American jewelry collection. This a large handmade vintage Art Deco sterling silver pin of a fancy lizard. Tested and guaranteed to be solid sterling silver. All hand made in different sections the old way; not a single cast piece. It is finely and intricately detailed. The fancy raised ball and braided sterling decoration is also all hand applied in many separate parts. Size is 2 7/8" long by 1" across the front feet. From an estate and unpolished. Condition is excellent. This is a lovely early hand made lizard pin for your collection. It is light weight and very strong, nice early hand crafting. Beautifully made by Henning Koppel for Georg Jensen this is a lovely midnight blue black enameled vintage modernist amorphic pin. Signed accordingly Georg Jensen (older oval circle marking), HK in oval, Sterling, Denmark #306. Other than a couple of small surface flakes (outer layer of enameling only) it is in excellent condition. Size is 2 1/8" long East West by 1 7/8" tall North South. Weight is heavy at 26.8 grams. This is a lovely very well-known pin by a very desirable maker for your collection.